Entry filed under: dogs. Tags: food, gardening, just another day in the life. I found it hysterical that the ad at the end of this blog is for Roundup! That is funny! I don’t see the ads so I missed it. 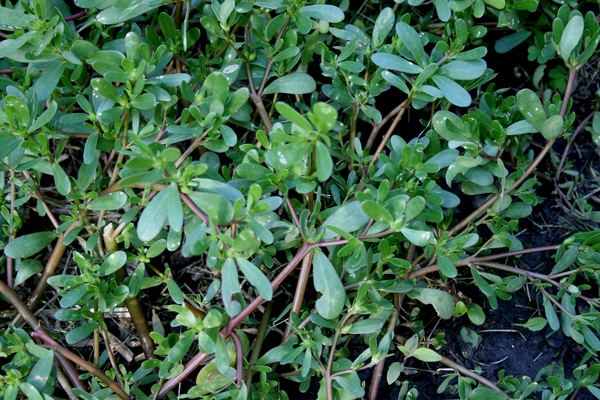 Purslane is listed as native to N.M. – I’ll send you a care package of seedlings if you like. It’s a hardy succulent, so should hold up relatively well to your climate. I may pick up some purslane seeds when we come visit next month. We can grow damn near anything, if you can get water to it. And, yeah, our weeds tend to end up as burs in our dogs’ coats. And then there are foxtails. Nasty, nasty things. When I was a boy, we found one had worked its way to the other side of my dog’s eye. It required surgery to remove it. I don’t think the purslane will last as a living mulch — around here, it grows like crazy in the early to mid summer, but after it flowers, it tends to disappear. Then other weeds will fill in, So I would use it for feed for humans, dogs and chickens, rather than leave it as mulch. I would think it would be really good for the chickens and up your eggs’ nutrient content. 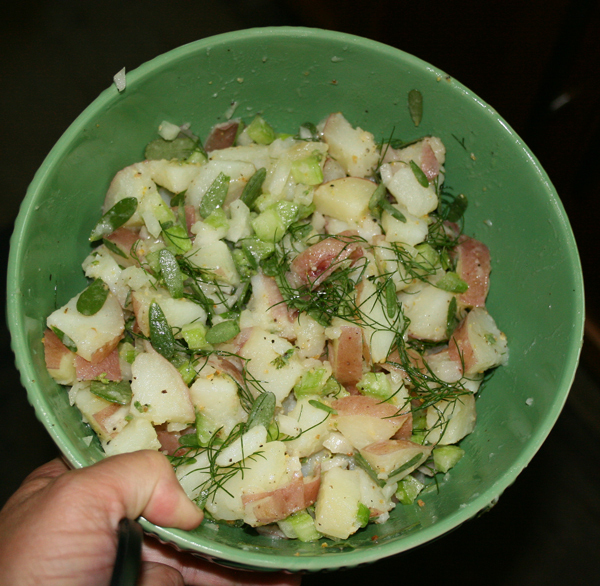 There are lots of good recipes for purslane on the web — when I had the community garden, we ate it regularly with things on our Tuesday night dinners. There isn’t a summer salad that isn’t better with purslane added. Supposedly, they deep fat fry it in Mexico, but we never tried that. Purslane is also a sign that your soil is in good shape for veggies, so if it’s growing well, it means you are taking care of your soil properly. The mullein isn’t such a good sign, but being in the rock garden, it’s probably not that important and rich soil might not do so well for rock garden plants. Foxtails are nasty things. When I was in undergrad school in Idaho a friend inhaled one and it worked its way into her sinuses. The rock garden is quite large (60ish feet long by 15-20 feet wide. I’ve done a lot of work to the soil in the more accessible areas where I grow veggies. In nooks and crannies I let it go and get creative with weeds etc. Mine only came up recently. I wonder if I’ve got a later variety? And – if it dies back later that’s fine. By midsummer the cucurbits will be taking over anyway. 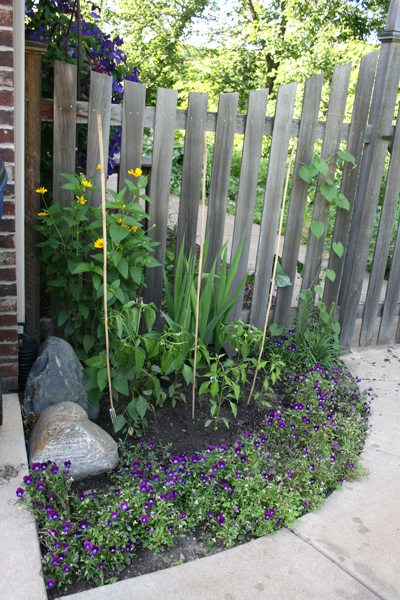 So – what can I use for living mulch in the spring? There are several varieites of purslane — you can actually buy culitvated varieties of it from folks that specailize in salad greens, but we has so much on our own that we never planted any. As for a living mulch in the Spring — depends on what you want to do. Dutch white clover is good for perennial area, but most folks are doing cover crops that they grow and then use a roller to knock down the plants into mulch and then plant their veggies in the rolled down mulch. Or you can cover-crop in the fall and let the frost kill it, then plant in the mulch. Cover cropping is becoming its own science so I would go to http://www.attra.org and do some surfing — it’s my favorite website for “what the heck do I do now” in sustainable ag. A very informative post, especially the creative use of Purslane.